I’ve eaten out a few times this month, and since I’ve had only good experiences, I thought I’d share them here. Normally I only eat at dog-friendly places, but I had occasion to be out and about without the pooch this month, so I took advantage of that and tried a new place or two. Some places I went with and without her, because they’re just too good to miss out either way. I’ll start with a newbie for me. Rabble is a relatively new re-incarnation of what was Ricks. It’s a boutique hotel/restaurant/cocktail bar, and it certainly does the restaurant/bar bits well. I went for dinner with three girlfriends on a Friday and we were all impressed with the menu and the service. The menu is varied, with great choices if you’re on a bit of a health kick, or just want to leave enough room for numerous gin and tonics and some dancing later on. We ordered two Superfood Salads with chicken, a venison, and a salmon. Everything was declared to be delicious, and exactly what was needed. The decor is light and airy, despite being on the lower ground floor of Frederick Street, and the atmosphere was lighthearted and bubbly. They’re definitely dog-friendly during the day, so I’ll be coming back for lunch with Kimber. I love The Roseleaf, but it’s not dog-friendly so I don’t get to go there very often. The other weekend, however, I didn’t have the pooch to worry about, so I went to meet some girlfriends for lunch. One friend had the all-day breakfast, which came in a skillet and looked delicious, and I had a large cullen skink, which tasted delicious. The atmosphere is really relaxed and friendly, and they do a number of great juices, of which we sampled a few and loved them. It’s located near to The Shore in Leith, so if you’re down that way I can totally recommend a visit. Although be sure to book a table at the weekend. I didn’t eat at the Beach House this time, but their breakfasts are very good. I love to go for the view, but as it’s not dog-friendly, I don’t get to go as often as I would otherwise. I’ve probably shown you this before, but here’s what I was writing next to the other day! Pretty gorgeous, no? 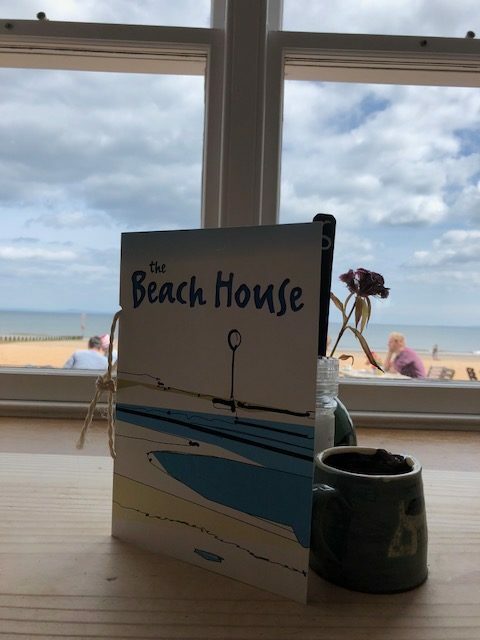 So if you’re in Portobello, I can recommend the Beach House for breakfast, lunch, coffee and cake. It’s no secret that I love Loudons. The great thing is that they’re dog-friendly, and I’ve been here this month with and without Kimber. The husband and I brought her here for lunch a few weekends ago, and had two different variations of their eggs benedict interpretations: they do eggs benedict fifteen ways. Yes, that’s right, fifteen. If you’re in Edinburgh and looking for an amazing breakfast, this is your place. They do lots of other things too, all of them delicious, and they do the eggs benedict at lunch too. So if you’re on holiday and fancy a very long lie-in, you won’t miss out. The time I came without Kimber, which is actually right now, I had a couple of teas and a carrot cake. Very nice. If it’s a month of the year, then you can bet that I’ll have been at the Refinery. I’ve been there twice this month with different girlfriends, both times with Kimber. They are so dog-friendly, which seems unusual for such a lovely cocktail bar/restaurant, but then this is Edinburgh and we love our food and drink, and we also love our dogs, so more fabulous establishments are welcoming us in. I love everything about The Refinery: the food, the decor, the atmosphere, the drinks selection, and the service. It’s so close to Waverley Station that it’s easy to meet friends, and to get there ourselves. I recommended it to some girlfriends earlier this month for a Saturday night dinner, and they declared it to be absolutely perfect for what they were looking for. I haven’t eaten here, but I think it deserves a shout out for a bit of incredible customer service. When I was trying to find somewhere for my girlfriends to eat the other Saturday – this was at lunchtime on the day they wanted to have dinner, and the criteria was very strict: healthy food choices, good drinks menu, central, and great atmosphere – I called Copper Blossom to see if they had a table. As it was lunchtime, my call went to their answering machine. I didn’t want to wait for a callback, so I checked online and found that they were fully booked. About an hour later, I got a call from a lady at Copper Blossom, explaining that she could see that they’d missed a call from me. I explained why I’d been calling and she checked and confirmed that they were fully booked. Even though my girlfriends didn’t get to eat there, I liked the menu, and I was impressed at the callback, even though I hadn’t left a message. And I’ve heard good things about them, so I will definitely check them out sometime soon. And that’s it! If you’re in Edinburgh and looking for somewhere to eat, these are my recommendations for this month. I hope your experiences are as good as mine, either way please share your views in the comments below.